Digital Signage System enables interaction via SAW touchscreen. Based on 1.66 GHz IntelÂ® Atom(TM) D510 processor and IntelÂ® GMA 3150 graphics chip, Model OFP240-D510 is suited for storefront campaigns, wayfinding, floor guides, and information displays. System is equipped with dual channel DDR2 system memory up to 4 GB and 1 SATA HDD slot. Featuring 24 in. TFT LCD panel with 1,920 x 1,080 full HD resolution, Model OFP240-D510 supports 4 USB 2.0 ports, 1 COM port, 1 PCIe Mini Card slot, and 10/100/1000 Ethernet port for data communication and expansion. Taipei, Taiwan, -- Axiomtek releases the most-watched 24-inch full HD multimedia interactive digital signage, the OFP240-D510. It offers full high-definition video playback and cutting-edge graphics performance to create a hype for storefront campaigns, wayfinding, floor guide, information display and so on. This signage platform is facilitated by an Intel® Atom(TM) processor D510 at 1.66 GHz and Intel® GMA 3150 graphics chip with low power consumption. It's surely the best solution for a various type of spaces across exhibition halls, chain stores, supermarkets, restaurants and many more. "The tremendous customer's adoption of Axiomtek's digital signage solution reaffirms our dedicated efforts in this field. This new addition to our digital signage series allows operator to quickly launch a highly functional solution that can grow along with their customers' needs" said Robert Wang, Director of Sales & Marketing of the Touch Panel Computer Business Unit at Axiomtek. Axiomtek all-in-one OFP240-D510 offers best C/P value for users. The unit is based on Intel® Atom(TM) processor D510 at 1.66 GHz and Intel® GMA 3150 graphics chip, having higher performance-per-watt, lower power consumption and graphics capability than previous Intel® Atom(TM) processor solutions. The outstanding digital signage platform built in 24-inch TFT LCD panel with full high definition 1920 x 1080 (1080P) which delivers supremely clear and lively content to attract audiences' attention. What's more, the operator can interact with visitors through a SAW touchscreen-based platform to increase mutual user experience. 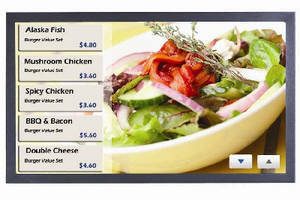 Axiomtek's multimedia digital signage OFP240-D510 is available now. For more product information or pricing, please visit our global website www.axiomtek.com or contact our sales representative at info@axiomtek.com.tw. Axiomtek's OFP series is an interactive and affordable full high definition digital signage solution which combines Intel dual-core Atom processor D510, full high definition (1080P) and SAW (surface acoustic wave) touchscreen. The touchscreen provides viewer with an interactive experience by pressing icons on the screen to access related information. The elegant ID is impressive and blends easily into any environment. The touchsreen is treated with an anti-scratch design up to 7H making it more durable for repeat usage in public places.